Growing numbers of people are researching therapeutic baths. According to the Saltworks company, bathing in Dead Sea salt may be particularly beneficial because it contains an array of minerals that include potassium, which helps to balance skin moisture; bromides, which reduce muscle pain and stiffness; and sodium, which improves the circulation of lymphatic fluid. Research has also shown sea salt to have an array of medicinal benefits. The magnesium in Dead Sea salt moisturizes the skin, according to the February 2005 issue of the "International Journal of Dermatology." Swiss researchers exposed volunteers with atopic dry skin to Dead Sea salt baths for six weeks. Bathing significantly improved skin hydration, skin texture and skin tone. Researchers concluded the magnesium in the salts was responsible, since the chemical is known to bind water to the skin, promote skin cell growth and improve skin permeability. 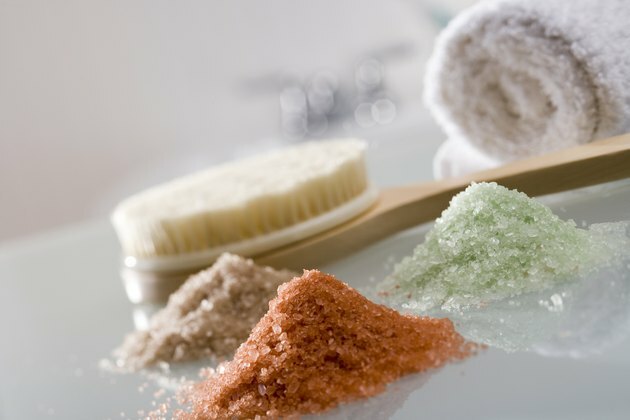 Dead Sea salts have antimicrobial properties that can provide therapeutic benefits to individuals, states the May 2006 issue of the "International Journal of Dermatology." Israeli researchers placed soil samples containing Dead Sea salt in petri dishes, along with various bacteria populations. They found that the mud inhibited the growth of candida and propionibacterium, even after being sterilized with gamma radiation. They concluded that the chemical makeup of the salts provided microbial protection. Dead Sea salt baths can provide pain relief that may last for weeks after the therapeutic session, notes the July 1990 issue of the journal "Clinical and Experimental Rheumatology." Israeli researchers treated individuals diagnosed with rheumatoid arthritis with heated baths treated with Dead Sea salts for 20 minutes daily. After two weeks, study participants experienced increased mobility and significantly less pain, with improvements lasting up to one month after the end of the study.